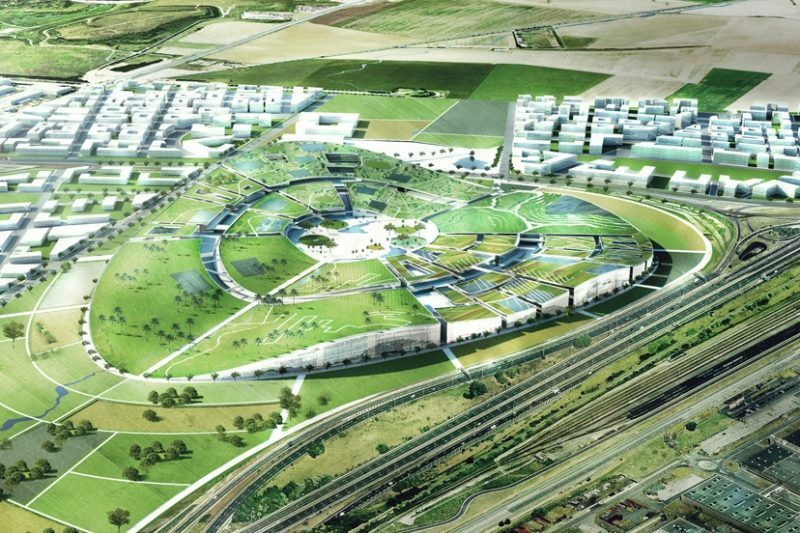 Who’s to Stop EuropaCity Going Ahead? At Gonesse, north of Paris, French hypermarket giant Auchan are planning to create a veritable behemoth of a development. This new 21st-century quarter will be a mixture of gigantic shopping centre and XXL-sized leisure zone with a theme park and indoor ski run. It’s an urban project which will overlay a large agricultural zone. France hasn’t seen the likes of this since the Disneyland Paris project. In France at the moment, there is a growing feeling of disgruntlement at what many feel as an attempt from forces unseen to dismantle a model democratic socialist society, and public opposition to projects such as the Sivens Dam and the Notre-Dame-des-Landes airport are indicators of that frustration. What chance, then, does a super-sized project such as EuropaCity stand? It may be due to a lack of public awareness, but so far, local opposition has been somewhat timid – something that the developers and many supporters in an ailing economy will be hoping to see continue. Located near Roissy-Charles-de-Gaulle Airport, the groundbreaking development will be 80 hectares in size, taking a decent bite out of the rich agricultural land in this area. From the gently undulating fields here, Auchan are planning to grow a brand-new modern-day commercial settlement with 760,000m2 of clean tiled surface. The retail group, which is controlled by the Mulliez family (a veritable retail dynasty comprising 50 companies such as Decathlon and Flunch, 470,000 employees and an annual turnover of €80 billion), is planning to plough €2 billion into the project. The shopping centre alone will cover 200,000m2. There will also be leisure facilities of some significance, including an indoor water park, indoor ski run, theme park and a theatre for an international circus company. The grand opening for all of this is scheduled for 2021; when the greater Paris public transport system will have reached as far as the site of EuropaCity. This will put the new development within 25 minutes of the Gare du Nord by means of an RER line due to be completed by 2020. The new RER line 17 of Grand Paris is expected to open in 2024. The main opposition to all of this so far emanates from an organisation called the Collectif du Triangle de Gonesse, who have already organised several demonstrations against EuropaCity. On its internet site (seemingly hacked at time of writing), the association accuses Auchan of destroying excellent agricultural lands. Indeed, the region council of the Ile-de-France region, with a Green-Socialist majority, adopted the scheme for the project, with EuropaCity as an integral part of it. “We’re building neither a dam nor an airport, but a destination that will be used by everyone,” adds Mr Dalstein, pointing out that according to a survey carried out at the end of 2013, more than 70% of citizens in the neighbouring communes were in favour of EuropaCity; which promises the creation of 115,000 jobs in direct employment. Those who oppose the development say that it’s a pointless exercise to create an enormous shopping centre when there are already two in the same area – one very recent property at Aéroville near Roissy and the other named O’Parinor with UK retailers Primark as the anchor tenants. EuropaCity estimates that with its cultural facilities, it will draw a crowd from much farther away than either of those two retail parks and that therefore, there will be no competition as such. It’s worth bearing in mind that this massive project is still very much a dream. No ground has been broken and the planning permission submission has not yet been lodged with the relevant authorities, but large projects promising thousands of jobs and with strong local and governmental support tend to get built on time. Next Next post: Dreaming of French Campsite Holiday 2015?